Colorado is home to some of the most dangerous occupations in the United States. The timber, mining, oil, and gas industries are all very important to the state's economy, but those who work in such fields are at risk for injuries and death virtually every day. All told, thousands of Colorado workers are injured on the job every year—many of whom never fully recover. At Hoggatt Law Office, P.C., our skilled workers' compensation attorneys are dedicated to helping you obtain the benefits you deserve after a workplace injury. Workplace injuries can happen to any worker in any industry. Some injuries are relatively minor—including bumps and bruises—while others can cause permanent disability or death. If you have been injured at work, you may be facing years of treatment and rehabilitation, not to mention a decreased ability to continue working to your full potential. Hoggatt Law Office, P.C. is a small law firm, which means that we become personally invested in every case we take on, including yours. When you choose Hoggatt Law Office, P.C. to represent you in your workers' compensation matter, you become a part of our family. We take the time to get to know you and your family and to understand how your injury is affecting your life. As your case moves along, we will communicate openly and honestly with you so that you are always fully up to date on our progress. We also make ourselves available to answer your questions and address any concerns that may arise. Most injured workers are entitled to workers' compensation benefits under Colorado law. This idea leads many victims to believe that they will automatically receive all of the appropriate benefits with no problems whatsoever. Unfortunately, things do not always work out that way. If you sprained your ankle at work, for example, and you missed half of one day with no lasting issues, you probably do not need a lawyer. If, on the other hand, you broke a bone in your leg, your prognosis for recovery is in doubt, or your claim has been denied, an attorney can help you take action. You should also contact an attorney if you believe that you will be unable to return to work or you have questions about the workers' compensation claims process. If you would like to learn more about obtaining workers' compensation benefits in Colorado, contact our office. Schedule a free, no-obligation consultation by calling 970-225-2190 or 1-800-664-3151 today. Hoggatt Law Office, P.C. 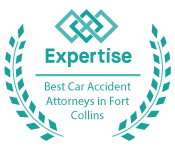 represents injured workers in Larimer County, Boulder County, Weld County, and throughout the surrounding areas.